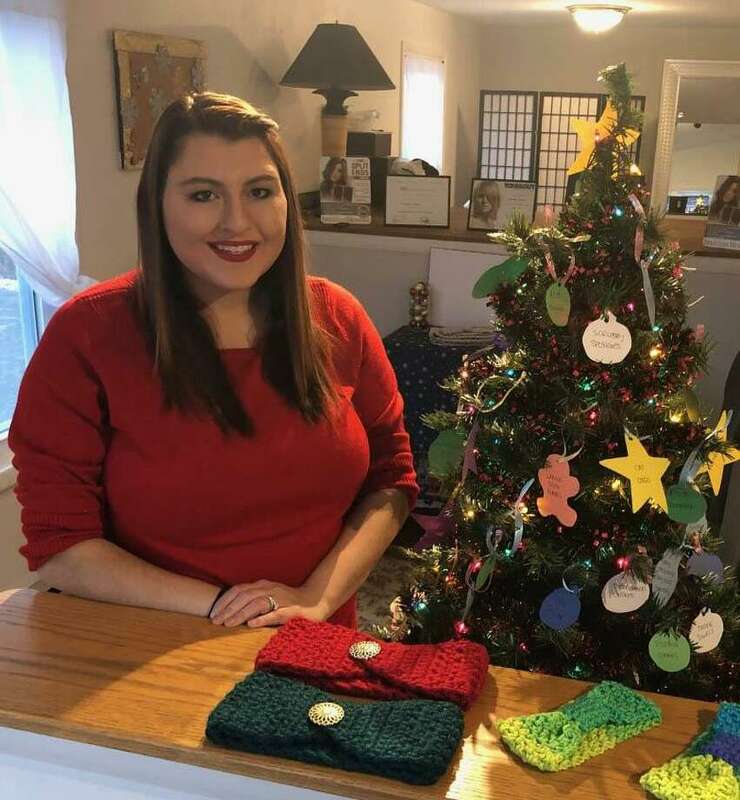 Amanda Shrack, owner of Amanda Rose Salon & Boutique in New Milford, is offering a holiday giving tree to support Animal Welfare Society in town. The Amanda Rose Salon & Boutique in New Milford is all about giving back to the community this holiday season. The Route 202 business is showcasing a giving tree to support the Animal Welfare Society in New Milford, an independent, nonprofit and non-destroy animal rescue on Dodd Road. “Animal Welfare is a great cause and they give a lot to the town,” said owner Amanda Shrack of why she decided to launch the campaign. Items from the shelter’s wish list are listed on ornaments hung on the giving tree. Patrons are invited to purchase an item on an ornament. Founded in 1965, the shelter serves New Milford, Bridgewater, Roxbury, Washington and Roxbury. Gardner said since the temperature has dropped, the number of animals at the shelter has increased, a common occurrence at this time of year. Community support such as this provides the necessary supplies to care for the cats and dogs. “She’s a good egg,” said resident and client Enza Sorbara of Shrack and her charitable act. Shrack also sought sponsors for the holiday campaign. In five days, she received $1,000 to support AWS. Patrons who donate an item listed on an ornament will receive a discount or coupon for a service at the salon. Donations for the shelter will be accepted through the rest of the month. Shrack, 26, will celebrate her salon’s fourth anniversary in February, a month after she expects to add discounted wedding dresses. “They’ll be just as good, but won’t have the designer name,” said Shrack. By spring, Shrack hopes to add professional hair care products to her salon and prom dresses to the boutique and, by sometime next year, a mobile bridal bus to serve wedding parties. The addition of wedding dresses in a few months will complement the existing services offered at the 72 Park Lane Road (Route 202) salon: hair color, cuts, styling and smoothing; bridal party and special event makeup and hair styling; and facial waxing. Cuts for men, women and children are available, but the majority of her clients are women and children. The owner also recently added custom-made headpieces using pins, hair combs and clips, as well as crocheted head bands to her boutique. She said she expects she will eventually incorporate veils into the custom headpieces, too. “It’s a creative outlet,” Shrack said of the headbands and headpieces she makes while at home, away from her day job as a para-educator and her time at the salon. Shannon Powell, of New Milford, and her three children have been Shrack’s clients for six years. Powell praised Shrack’s patience with clients, including Powell’s children, one of whom is “nervous and scared” when it’s time to get a haircut. The New Milford native has always had a knack for the beauty industry. Even as a child, Shrack styled her sister’s hair. That passion led her to beauty school at Ricci’s Academy of Cosmetology, now TONI&GUY in Newtown, in the evenings while still in high school. After graduating, Shrack knew she didn’t want to work for anyone else. “If I have a passion for something, I have to do it my way,” she said. “So, I took a leap” and opened a salon. “I wouldn’t do it anywhere but New Milford,” she added. Shrack, a color and bridal specialist, is joined by fellow stylist Alison Merritt-Pelillo. The Amanda Rose Salon & Boutique at 72 Park Lane Road (Route 202) in New Milford is open Tuesdays through Fridays from 3:30 to 7:30 p.m., Saturdays from 9 a.m. to 2 p.m. and Sundays and Mondays by appointment. Appointments are strongly recommended. For more information, call 860-671-8486 or email amandarosesalon@gmail.com.